Make your dock safer at night with this Solar LED Dock Light. Its heavy-duty aluminum construction will resist the elements and pedestrian traffic while providing ample light to increase visibility on and around your dock or deck. This beautiful 5 step Aluminum Dock Ladder was made to get into the water and to facilitate getting out of the water. Its very deep 5 steps are easy to climb and comfortable to assure foot comfort and its smooth rounded arches made of strong 1 in. diameter tubes can be securely grabbed by small children's hands. This Multinautic Dock Ladder will fit on any Aluminum or wooden Dock, stationary or floating, and can be rapidly installed and removed with its J Hooks securing system. 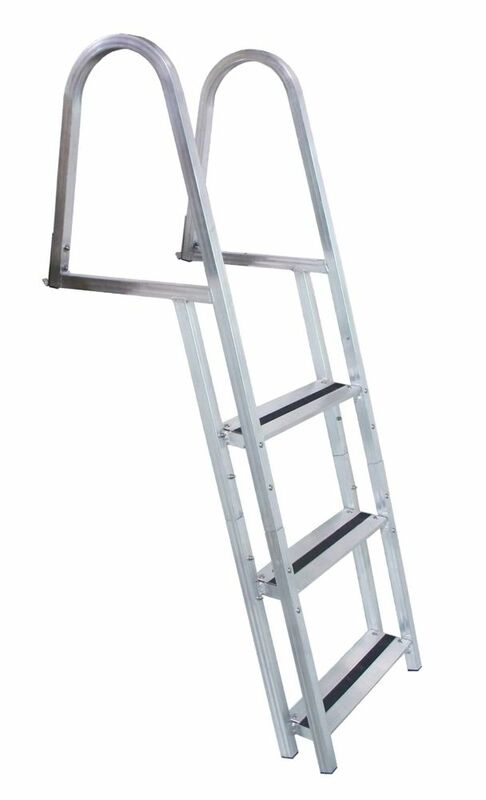 This Really Attractive Aluminum Dock Ladder has been carefully polished and anodized (at the same glance as those in stainless steel at a fraction of the price) for a look and a quality of finishing without comparable. Unlike all other aluminum basic ladders with a raw finish and messy, your hands will not stain and remain clean. It also offers extra wide and very deep steps that are comfortable for the feet. This Ultra Sturdy Ladder is made of solid 1, 5 in. diameter tubes and presents arches with fluid lines. You can also add extra steps (15528) for more water depth and the Flip-Up Dock Ladder Kit (15529) to raise the ladder and prevent debris from sticking to it. Without a doubt, the Nicest, Cleanest and Strongest Ladder of all categories offered, Guaranteed! Stand Off Aluminum Dock Ladder, 3 Step is rated 3.0 out of 5 by 1. Rated 3 out of 5 by Paul from Several problems Dock ladder came with vertical frame member bent so that bolts could not be installed, and two connecting bolts with sleeves missing. I bent the frame into shape myself and contacted Dockedge by email about the missing parts. I never heard back from them so I purchased galvanized bolts at the hardware store and fabricated two sleeves out of an old curtain rod. I then assembled the ladder, making sure that the bolts I had supplied were in the uppermost position so they would not always be in the water. Now that that's all done the ladder works well. It is difficult to review a product like this. I think the average consumer would have returned it in disgust but I hung in there, made the repairs and now have a nice dock ladder . What is the width and depth of the tread? What is the distance between steps? What is the distance from the top edge of the dock to the bottom step?